Many people find spiders creepy, but I think that they are cool. One of the most amazing species of spider is the golden orb weaver. Female golden orb weavers are much larger than males, with a body that grows up to 5 cm across, which is 10 times the size of the males. Their legspan can be 14 cm across. They get their name from the colour of the giant webs that they build, which have a golden-yellow colour which is thought to attract flying insects. The females build massive webs that are over 1 metre across and are made from very strong silk. Each web has one female and can have more than one male living in it. Other small spiders, called quicksilver or pirate spiders can also live in the web, eating small insects that are caught in it. The webs are so strong that they can trap small birds and even bats. Breeding time is very dangerous for the males as they can be caught and eaten by the female. After breeding, the females lay hundreds of eggs and then both the males and females will die. Golden orb weavers are found along the east coast of Australia, from Queensland to Victoria. Although they look scary and have a painful bite, they are not considered dangerous to people. 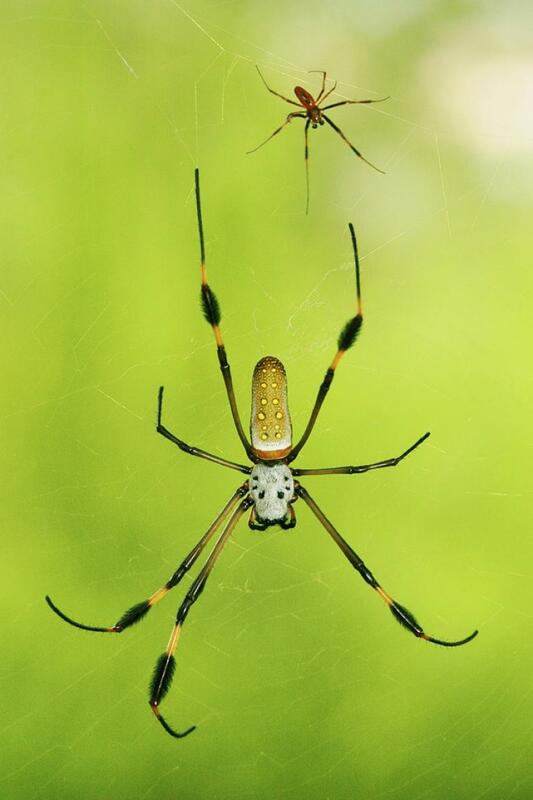 Are there any other interesting facts that you would like to share about golden orb weavers? Golden orb weavers also live in Mississippi. I have one in my front yard!